Home News IFFA 2019: All market leaders on board! 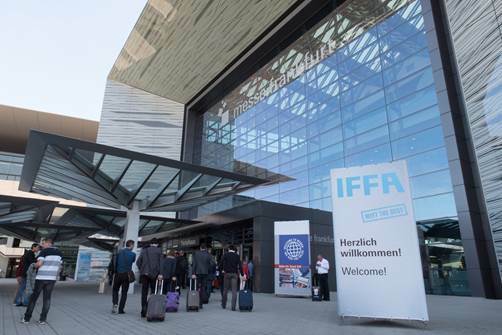 More than 1,000 companies from around 50 countries, including all market leaders, are set to present innovations and future-oriented trends for the entire processing chain of the meat industry at IFFA from 4 to 9 May 2019. IFFA is a must for manufacturers of machines and equipment for processing and packaging meat and meat products. The timing of the fair and the exhibitors’ innovation rhythm go hand in hand with many products being launched onto the world market at IFFA. Altogether, trade visitors to the fair come to Frankfurt from around 140 different countries. The overview of developments throughout the entire sector helps butchers and the meat-processing industry make their investment decisions for new technologies and reveals new concepts and strategies for the future of their own companies. In Halls 8, 9 and, for the first time, Hall 12.0, suppliers of machines and equipment for slaughtering, dismembering and processing, including boiling, smoking, roasting and baking, present their latest products and developments. Visitors can look forward to an extensive range for meat-industry companies of all sizes. The companies making presentations in the slaughtering and dismembering segment include, for example, Bettcher, EFA, Freund, Frontmatec, Haarslev, Jarvis. JWE Baumann, Marel and Renner. The processing segment is represented by many international market leaders including companies such as Fessmann, GEA Food Solutions, Grasselli, Handtmann, JBT, Metalquimia, Poly-clip System, Provisur, Risco, Schröter, Seydelmann, TREIF, VEMAG and Weber. The continuing popularity of convenience and take-away articles is stimulating the demand for packaged meat and sausage products and, at IFFA, the exhibitors show a cross section of relevant packaging technology, from the packing line, via labelling and packing materials, to weighing, measuring and testing technology. The market leaders, including Bizerba, Espera, Flexopack, Ishida, Krehalon, Mettler Toledo, MULTIVAC, OSC Wipotec, Schur Flexibles, SEALPAC, ULMA, Variovac and VC999, present their latest products in Hall 11. Important companies from the automation and IT segments, such as CSB System, igus, JUMO, Rittal, Scott Automation & Robotics and Winweb, also exhibit at IFFA. Exhibitors of spices, additives and casings for making meat foodstuffs have moved to the new Hall 12, which opened last year. Specifically, they will be presenting their spectrum of products in Hall 12.1. Among the companies ready to take part are, for example, Almi, Devro, Frutarom, Hydrosol, Meat Cracks, Moguntia, Naturin Viscofan, PCF Atlantis-Pak, Peter Gelhard, RAPS and Viskase. In Hall 12.0, visitors will find the ‘Sales – everything for the butcher’s shop’ with, in addition to the stands of the German Butchers’ Association (Deutscher Fleischer-Verband – DFV) and the Central Cooperative of the German Butchers’ Trade (Zentralgenossenschaft des deutschen Fleischergewerbes – Zentrag), the complete spectrum revolving around sales and shop fitting. The companies making presentations will include Aichinger, BFM Ladenbau, Kramer, Ladenbau Hanke and Schrutka-Peukert. An overview of all exhibitors, their location and products can be found in the online exhibitor search engine at www.iffa.com/exhibitors. For further information and tickets, please go to www.iffa.com.